Over the years I have done many trades shows. Attending the biggest, COMDEX, Las Vegas to small regional Society of Human Resource Managers (SHRM) groups. 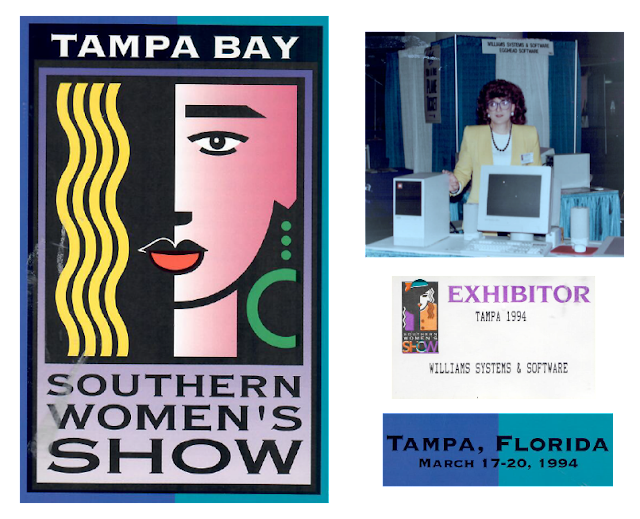 With my booth, I was a vendor at many of the National SHRM Conferences (1985-2000). My product at the time was a corporate HR System. During the late 80's and 90's, there was a market for custom built computer hardware. Assembly was straight forward and the set-up fun. I found that with smaller organizations, if I offered a hardware and software turnkey option, the decision became less complicated. Remember this was a time when not everyone had a computer on their desk. I worked with a wholesale supplier of parts and expanded my market. I even built a few systems for friends and my "just computer" business grew. It was something to do between large company installs and training. 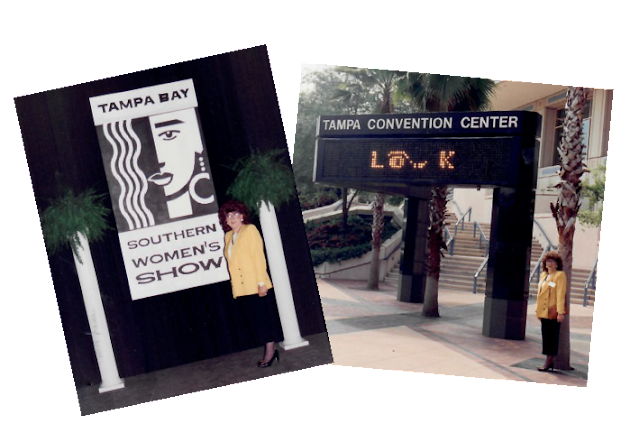 I saw an ad for the "Southern Women's Show" in Tampa and at first thought, this would be fun to attend. I called and got a ticket and out of the blue asked if they would like a computer vendor. There was no hesitation they thought this would be great addition to their show. Most vendors were jewelry, cooking, makeup, and fashion shows. I committed. I built a new system, installed the OS/Software, set-up the sound, took along a huge monitor (for the day) and I was set. I offered to shared the booth with "EggHead" which was just retail then and they accepted. EggHead displayed software and together we did demos. Remember this was 1994 with sound just taking off (multimedia as it was called then). Many mothers were interested in games and learning programs for their children. We worked together in the booth for three days. Egghead did quite well. Truth be told, being at an all Women's Conference was so much better than all of my other conferences. It was so much fun! Please note: I am not bragging about the things I have done. In fact, most of what I write about is pretty mundane. What makes these escapes exciting for me, was getting out. I wanted to be Rhonda and if someone notices, so what. I wanted to be in the real world, doing what all women do. In the 80’s TG conferences and support groups, although confidence building, only enlarged my closet. However doing the mundane as Rhonda was exciting; still is. Best of all I created memories and have the photos or prove it. I also made friends and interacted. Thank you for allowing me to share these. Please tell us about your confidence building escapes. I apologize for the quality of the collage above. I have exactly what you see above, framed, 20x24 as a memory of the event. I could only scan 8.5x11 so had to take the mat out of the frame and scan in sections. What a great experience Rhonda and, if you don't mind me saying, head and shoulders above going to a trans related event. Yes this poses more of a challenge but the reward is so much better!